The reason it’s complicated is because we like to think of speed as the motion of an object in some absolute, universal reference frame. In our every day experience, this works just fine. In general, however, it doesn’t work. For one thing, motion is relative, so an object’s “speed” depends who’s measuring it. At speeds approaching light, special relativity also comes into play, which leads to strange things like time dilation and length contraction. To demonstrate this, suppose we had a rocket that could accelerate at a constant 1 gee. This would mean the passengers of our rocket would experience the same “weight” they feel on Earth. To travel to another star, we simply accelerate toward our destination until we are halfway there, coast just long enough to flip the ship around, then decelerate for the second half of our journey so that we stop at the end of our journey. The nearest star system is Alpha Centauri, which is 4.3 light years away. The trip on our 1-gee rocket would take about 5.8 years from Earth’s point of view, and our ship would reach a maximum speed of 0.948 c, or just shy of 95% of light speed. From the point of view of the passengers, the trip would take only 3.56 years. From the point of view of our passengers, they traveled 4.3 light years in 3.56 years, which is an average speed 1.2 times faster than light! Things get more strange if we take a trip to Gliese 876, a star system 15.3 light years away with 4 known planets. 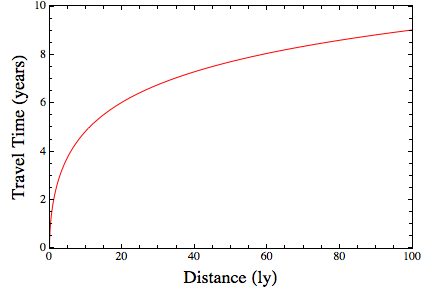 Seen from Earth, the rocket will take 16.7 years to reach Gliese, and reach a maximum speed of 0.993 c. For our passengers, however, the trip will only take 5.6 years, so their perceived average speed is 2.7 c. I’ve plotted the travel time of our passengers as a function of the distance of their trip in the figure below. You can see that the farther they go, the more dramatic this effect gets. Taken to extremes, our passengers could travel to the Andromeda galaxy (2 million light years away) in only 28 years from their point of view. So what’s really going on here? One thing all observers can agree upon is that the speed of light (in a vacuum) is constant from their point of view. 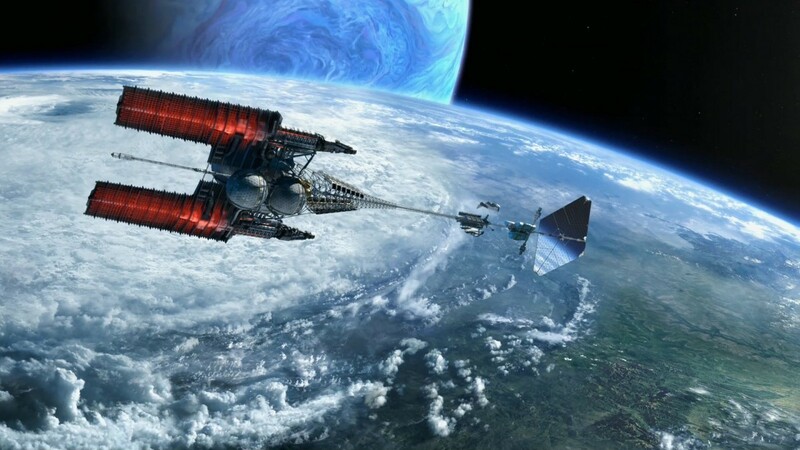 A lab on Earth and a lab on our accelerating spaceship will both measure the same speed. The only way for an Earth lab and a lab moving at nearly the speed of light to agree on light speed is for time and distance to depend on your point of view. In other words, space and time are relative. As the rocket speeds up, observers on Earth would see that time for the passengers is slowing down. So Earth observers would say the trip to Gliese actually took 16.7 years, but the slowing of the passenger’s time means only 5.6 years passed for them. From the view of the passengers, the distance between the Earth and Alpha Centauri appears to get shorter as they speed up. At any point in their trip they would still measure their speed to be less than light, its just that the faster Earth and Gliese are moving relative to them, the shorter their separation distance appears to be. Clearly our rocket is not real, so you might be inclined to think that this is all speculation, but these effects have been observed on a smaller scale. In fact, the GPS in your phone has to correct for these effects in order to work properly. The upshot of all this is that “speed,” “distance,” and “time” depend on your point of view, and they change in such a way that all observers measure the same speed of light. Of course if you add gravity to the mix, things get even more interesting. But I’ll save that for another time. But if we could open Quantum Portals…. I have a question: the observers on earth measure the travelling space ship to be accelerating and moving at a large percentage of the speed of light with 16 odd years passing for them to reach Gliese; the space ship experiences only 5 odd years passing due to – from their perspective – the distance being shorter; what speed do they measure themselves as travelling at in relation to Earth and Gliese? The same percentage of the speed of light but over a shorter distance? Also! 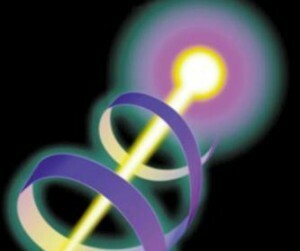 Why is the speed of light what it is, as opposed to something different? Why is it 299 792 458m/s and not 303 011 219m/s or 285 820 999m/s? I’ve had the following question on my mind for a couple of years. If its true that mass would become infinite if by some factor it were accelerated to speed of light, inversely, using the same mathematics, is that why light is gravitationally bent inwards towards the matter constituting a black hole? What I mean to say is, is the the fact that if mass would become infinite if by some factor it were accelerated to speed of light, is that a measure of what creates a black hole when mass is accelerated inside an exploding large star or super nova? The “relativistic mass” of high speed is the apparent inertial mass of an object. It is not the gravitational mass. In fact, from a fast moving object’s point of view, its mass is the same as it ever was. Just had a light bulb light in my head as to why relativistic mass would also be the proper term to use relative to what I am asking, rather than gravitational mass. Resultant black holes themselves form with different masses which later on accumulate more mass at different rates. We know that the universe is getting larger with a speed greater than light so that the observable universe is getting smaller by time. At least this is what i understood from Krauss’ article on scientific american The End of Cosmology. Does it contradict with the speed of light as the highest speed limit? *In science, we need deeply explanatory theories say scientists David Deutsch and Paul Lutus. Without explanation , we do not have much. They both say testability and prediction, while essential, are not sufficient by themselves without deeply explanatory theories. *As far as cranks and charlatans, is a common characteristic that they will say “Prove me wrong” and turn science on its head? Yeah, “prove me wrong” is a common one. So is “the idea is valid” and the details are left as an exercise for the reader. I read further into the article, about the bit of the resultant order that can emerge out of turbulence. I wondered that if the latter is true, that of matter at the speed of light becoming a black hole energized into order, would that shed light on the internal nature of black holes or/and on the nature of high energy jets resulting out of accretion discs? Just thinking if there is intelligent life out the and they have been signaling each other could it be this time difference the reason its not being picked up, could the wave band be to close together to see that there is a signal? Just thinking if there is intelligent life out there and they have been signaling each other, could it be the time difference that is the reason its not being picked up by us, could the wave band be to close together to even see a signal? Excellent article. When we look at the sky in the night, we are indeed seeing the past, and the image of Andromeda galaxy we see, is 2.54 Million of years old. In other words, in the Earth frame, it takes 2.54 Million light years for the photons to reach here. BUT, in the photon’s frame, it is “instantaneous”, since length contracts to ZERO. So, in the frame of reference of Photon, it is able to travel 2.54 Million Light year in “ZERO” seconds. So, what is the effective speed? So, as far as the Photons are considered, they are “fresh”, not 2.54 Million year old? Does that mean that Andromeda Galaxy is still there? Or, are we seeing only the past, nothing is there? You can’t take an average over an acceleration in that situation, and get a relevant speed. It’s simply wrong – at any particular point on the journey, from any particular viewpoint, the speed is less than lightspeed, and that’s the relevant way to take it. This guy doesn’t know his stuff. You find people saying “excellent article”, but they say it because they know even less than him. But how are they to know? I point this out because understanding these things is hard enough for a beginner even when you have the correct stuff in front of you – I don’t want it to be even more so. If you read the article, that’s the point. At any point of observation your speed is less than c, despite the fact that you can travel thousands of light years in a few months in principle. You’re mixing viewpoints. There are different ways to set this out, but some relativists would say that length contraction affects the distance. In that way of putting it, you’re taking v = d/t, but the ‘d’ is from one frame of reference, while the ‘t’ is from another. That’s why the ‘v’ you get is incorrect. Read the article. It isn’t claiming that thing travels faster than light. It takes a simple calculation of distance over time, and then explains why that isn’t valid. Hi Brian, thanks for the interesting article, but it’s hard to grasp though ;p Wish you can make another one about this topic so that we can learn more.